[Jakarta, LTTW] As we often ask and talk about, what does music means to us now? Where will it go, or how far it will succeed in materializing a dream? Well, the simplest way to answer those questions is to bring out the living evidence of one that does exactly that. Meet El Sistema, a one of its kind music education program based in Venezuela. What they have done for nearly 35 years has shown the world that none can really stop one from materializing a dream, that is to transform the life of children around nation for a much better life, one note at a time. The idea of El Sistema was first initiated by Jose Antonio Abreu, an economist who is also a classically trained musician. Being born and raised in Venezuela, one of the developing country in the world that have familiar problems such as poverty and injustice, Mr. Abreu conversely believes that every children throughout the nation deserve the same opportunity to share the same dream as him, with no cost whatsoever. From the very beginning in 1975, with only just eleven kids coming to the program, he had predicted that it will be recognized in a global scale as a movement of solidarity toward a brighter future. Through El Sistema, he convinced those children that music is a cultural expression, a system of thoughts, as well as a social engineering. Thereby, with learning and performing music in a communal means, gradually they have established a system to increase intellectuality within individuals, foster their self-esteem within family circle, and encouraged public-esteem within the community. 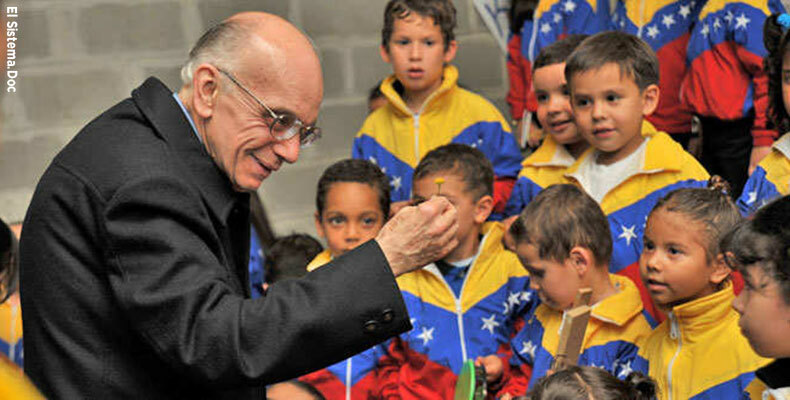 The result is quite obvious; Thousands life of children were “rescued”, the crime rate was significantly reduced, while one member of the Simon Bolivar Youth Orchestra of Venezuela, a result of El Sistema, said that in this particular time, ‘music is life, there’s no other way.’ How is this possible? Who would have ever imagined kids from the most dangerous barrios in the world—the murder and gun violence rates in Caracas are the highest of any non-war-zone in the world—play Beethoven, Bernstein, and Bartok as well as the best players in the world? Without a doubt, dreams demands struggle, and the case of El Sistema is particularly telling. Teaching and learning methods among the educators and the kids are probably one of many challenges El Sistema has to tackle. Not to mention the fundamentals they need to build, such as healthy funds, then dealing with the kids’ parents, and of course the cultural issues—we shall not forget that El Sistema utilizes Classical Music as their vehicle, in a country with no particular tradition of Classical Music. In the end, nothing worth doing has ever been easy, and there is no substitute for hard work, unless this is a mere fantasy. Certainly, El Sistema is not a fantasy; it is dream, materialized.